Less than 10 days ago, a few sporadic demonstrations about economic hardships across Iran sparked a global media frenzy. In a matter of hours, social media became delirious with #IranProtest, awash with confident assertions that “The Iranian People want regime change”. Donald Trump waded in with his support. Nigel Farage, the unlikely new champion of Iran’s revolution, hosted an LBC radio Iran special. Despite all of this excitement, reports from Tehran over the past few days have suggested that #IranProtests may - for now - be fizzling out (read brutally contained by the authorities). Within the first days of protests and rioting, we posed the obvious question, "Are we witnessing regime change agents hijacking economic protests?" - this after the US State Department's first statement declared solidarity with "freedom and democracy seeking" protesters while prematurely speaking of "transition of government". Immediately came the predictable flurry of tweets and statements from government officials and think tankers alike echoing the familiar script which seems to roll out when anyone protests for any reason in a country considered an enemy of the United States. And then there was Bibi Netanyahu's surprising televised address to "the Iranian people" on behalf of the state of Israel, wishing them "success in their noble quest for freedom" - something which we predicted would only have an adverse effect on the demonstrators' momentum, considering that authorities in Tehran accused protest leaders of serving the interests of and being in league with foreign "enemies" like Saudi Arabia and Israel nearly from day one. The address was surprising precisely because it was the surest way to kill the protests as quickly as possible. From the moment Netanyahu publicly declared, "When this regime [the Iranian government] finally falls, and one day it will, Iranians and Israelis will be great friends once again" - all the air was sucked out of whatever momentum the protesters had. For many average Iranians who had not yet joined anti-government demonstrations at that point, Bibi's speech gave them every incentive to stay home. All that the regime had to say at that point was, "see, you are in league with enemies of the nation!" And that is exactly what Tehran did. It was on the very Monday of Netanyahu's speech that Iran's elite Islamic Revolutionary Guard Corps (IRGC) announced it would be taking charge of the security situation in Tehran, though likely they were mobilized earlier. Early on Sunday the IRGC declared that rioting, sedition, and demonstrations are now finished: "Iran’s revolutionary people along with tens of thousands of Basij forces, police and the Intelligence Ministry have broken down the chain [of unrest] created... by the United States, Britain, the Zionist regime [Israel], Saudi Arabia, the hypocrites [Mujahideen] and monarchists," a statement from the group’s Sepahnews website said. Also on Sunday state TV reported that Iranian Parliament held a closed-door meeting to assess the security situation throughout the country - no doubt they were talking about the plotting of external enemies to exploit Iran's domestic situation. And who can blame the Iranian authorities for believing this? Even France seemed to be in rare agreement with both Russia, China, and even the Iranian authorities on this one. White House response to the June 2017 ISIS attack on downtown Tehran: "We underscore that states that sponsor terrorism risk falling victim to the evil they promote." So likely, Iranians don't believe for a minute that either the American or Israeli governments actually care for people protesting on the streets - only a short while ago they were told "it's your fault" as ISIS shed blood in their streets and government buildings. During Friday's UN emergency session in which the US found itself isolated, France stuck by President Macron's earlier words blaming the US, Israel, and Saudi Arabia for stoking tensions and exploiting Iran's domestic unrest in a situation he said could lead to war. French Ambassador Francois Delattre urged Iran's enemies to back off, saying just before the UN meeting, "Yes, of course, to vigilance and call for full respect of freedom of expression, but no to instrumentalization of the crisis from the outside - because it would only reinforce the extremes, which is precisely what we want to avoid." His call to cautiously prevent the "instrumentalization of the crisis from the outside" was a clear reference to the repeat Israeli and US officials' demands for international solidarity with the anti-Tehran protesters in cause of regime change. 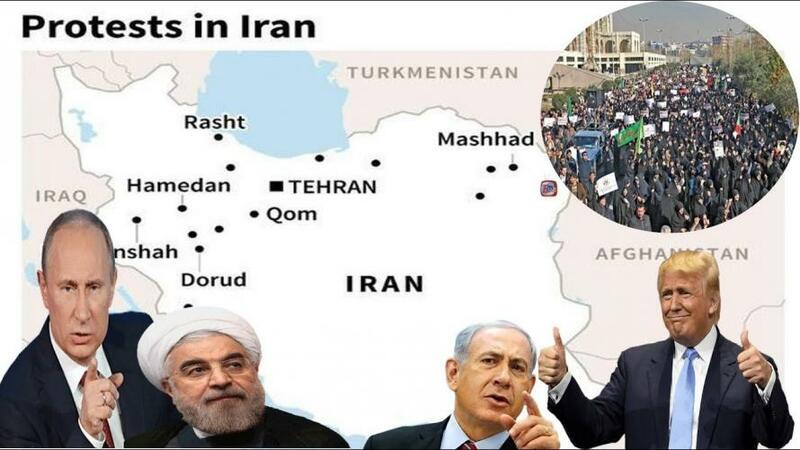 Or perhaps France also simply understood the obvious truth... that all the premature foaming at the mouth talk of Tehran regime overthrow coming out of Washington and Tel Aviv or other Western capitals would be the surest way to halt protests dead in their tracks. Because nobody wants to be hijacked in their cause... nobody wants to play stooge to foreign powers... nobody wants to be a geopolitical pawn, not the least of which the Iranians, who've had a long and bloody history of outside foreign meddling in their politics. Though the usual pundits will now simply fault the brutal and efficient IRGC for snuffing out the protests, they should look much closer to home.